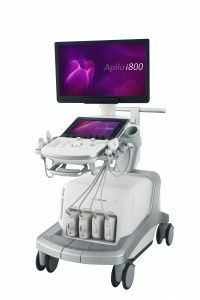 Building on its comprehensive Liver Analysis Suite currently available on the Aplio™ i800 ultrasound system, today Canon Medical Systems USA, Inc. introduces Contrast Vector Imaging (CVI). CHICAGO, Nov. 27, 2018 – Building on its comprehensive Liver Analysis Suite currently available on the Aplio™ i800 ultrasound system, today Canon Medical Systems USA, Inc. introduces Contrast Vector Imaging (CVI) to provide additional information on Liver hemodynamics and expand the use of contrast enhanced ultrasound on its premium ultrasound system. CVI helps visualize vascular structure inside lesions by tracking individual contrast bubbles and analyzing the direction and velocity of each bubble to help support a more confident diagnosis. The new tool has the potential to help clinicians better see complex lesion vascular networks, see clear delineation of feeding vessels with quantifiable perfusion and direction information. The premium Liver Analysis Suite on the Aplio i-series will be showcased at this year’s Radiological Society of North America (RSNA) annual meeting in Chicago, November 25 – 30, 2018 (Booth #1938, South Level 3). More information is also available here.